Everyone within driving distance is welcome to come. If your riding companion rides something other than a Morgan, they are still welcome to join us. We do request though, no Tennessee Walkers (or other gaited horses) take the lead position. It makes our Morgans trot to keep up with their “walk” and that gets old fast. The ride is scheduled for Saturday, April 12th. If the weather is bad (rain) that day – it will be postponed until Sunday, the 13th of April. This will be a pot-luck trail ride. You can either bring a dessert or salad, or chip in $4 for KFC and their sides. There is a large field for parking; easy in/out. If needed, there are corrals for those opting to stay overnight. Self contained campers are welcome to stay overnight. If you don’t have a camper – if you give me a little forewarning, I can reserve a small cabin at the RV resort 2 miles from my home. Cabins must be rented for two nights on a weekend – and that would cost you $50 total for the smallest cabin (sleeps four). 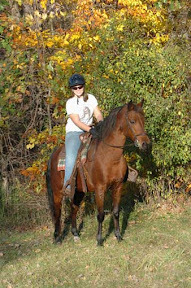 Trail ride is located in Davison, Michigan on Genesee County Parks land. This is approx. 20 miles NE from the I-75/I-69 intersection. We are an hour and half from Detroit, 2 hours from Toledo, 6 hours from Chicago, 3.5 hours from the Mackinaw bridge, and 1 hour from Sarnia , Ontario , Canada . I will have one, maybe two horses available to ride if needed. Rider must be knowledgeable/ experienced, and (my apologies) I have nothing that can carry a very large (heavy) person. Bring your own “wide” at the withers saddle, too. I won’t have enough to go around. We will cross a couple of busy, paved roads. There will be downed trees to step over or go around. There will be small creeks to wade through – some that you must go through to go on; in other words – you can’t go around them. Sometimes there will be muddy spots and large mud puddles on the trails. We ride through wooded trails, mostly. It follows a large river and lakes. We may opt to ride in a large public park where there are open fields and slow moving vehicle traffic. Since this is all on county park land, we may pass a fisherman or two, and a dog or two – some that aren’t always following the leash law, and maybe even an ATV or dirt bike. The pace is casual; mostly a slow walk, but we may jog once or twice, and may even pick up a short lope. Speed is very much sensitive to our riders’ and horses’ abilities. Several of the horses going know the trails and will only briefly hesitate at the water or mud obstacles. 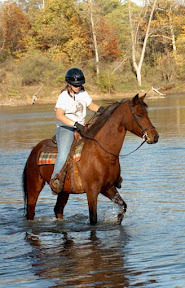 We are patient with horses that may take a few minutes to cross the water or mud, but you need to be aware these obstacles do exist and may frighten a timid horse or timid rider. These are incredibly beautiful trails. No hunting is allowed, and on most of the trails we won’t even see another soul but those in our group. It is very private. You may see deer, all sorts of ducks, geese, birds, cranes, rabbits, perhaps a raccoon. Mostly, you will just thoroughly enjoy a peaceful ride on gorgeous trails through the woodlands and lakes of central-eastern Michigan. It is a wonderful afternoon to bond with your horse and renew old friendships and make awesome new ones. By all means – bring your cameras, a lawn chair for the potluck dinner following the ride, and your own beverages.